Tamilarasi and Balarama waited 26 years of marriage for a child. They were over the moon when they discovered that their prayers had been answered. An early scan confirmed that they were expecting twins. 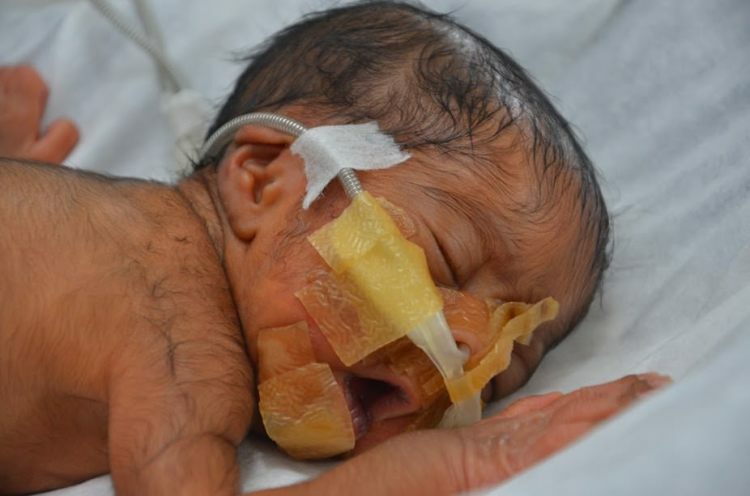 Everything was great until she started bleeding and went into premature labour in her 28th week. The family they had imagined might not turn into a reality if they cannot continue treatment for their babies. 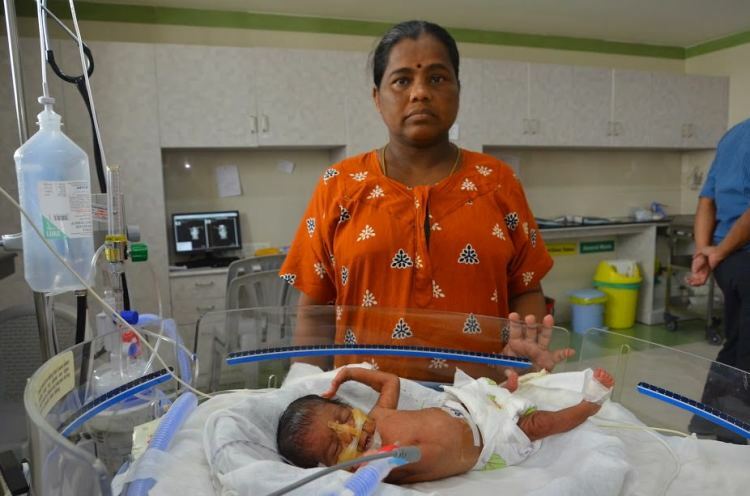 Tamilarasi was thrilled and she was eagerly waiting for the arrival of twins. Unexpectedly, her placenta detached and started bleeding. She was rushed to the hospital for an emergency C-section. A boy and a girl baby were born. 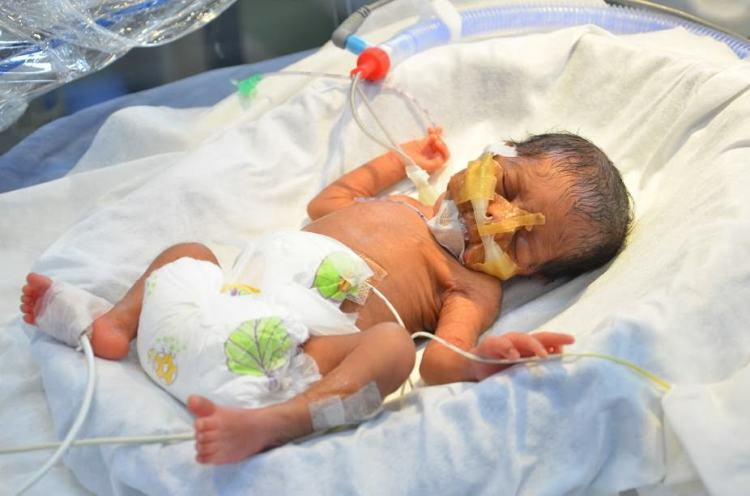 Even before she could hold them in her hands, the twins were taken to NICU. 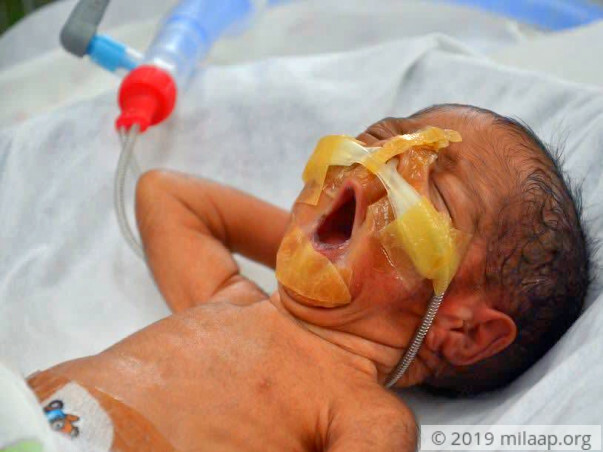 The babies were born extremely premature weighing only 1 kg. They have respiratory distress and are on ventilator support. Tamilarasi and Balarama are not able to take this situation, especially after being childless for 26 years. The twins are on tube feeds and need to stay in the hospital for 4-5 weeks until they recover from lung issues and to feed orally. They are waiting to take their babies home and live the life that they had yearned all these years. "I was happy when I came to know that it was twins. I thought God had heard all my prayers and blessed us abundantly. Now I feel this is the worst punishment ever, to see my babies fighting for their life even before they experience life. I can't go home without them, I can't even imagine that." - Tamilarasi. Balarama and Tamilarasi are from a village in Tiruvannamalai district, Tamil Nadu. They had to travel 6 hours to reach the hospital. Tamilarasi is staying at her sister's house near the hospital. Balarama is running from pillar to post to make money and save his babies. He saves every rupee he earns. He skips meals and does not buy anything for him. Whatever little money he earns, he gives to his wife and again he goes to work. Balarama and Tamilarasi are allowed only for few minutes in the ICU. They wait day and night for those few moments. 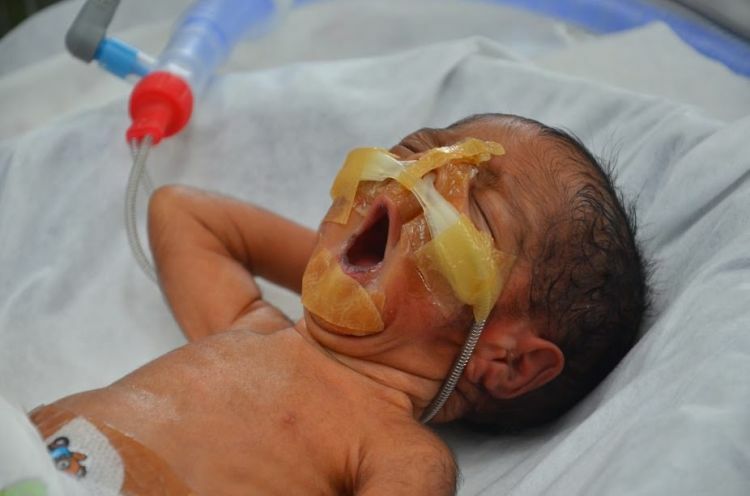 It is painful to see their newborn babies with tubes all over their bodies. The doctors said that they are recovering and are hopeful they will be completely fine in few weeks after the treatment is over. "Everytime I touch my babies I promise them that I'll not let them go at any cost but I don't know what I can do to save them. I feel guilty and frustrated. I'm willing to do anything for them. I waited for 26 years, how can I lose them? what did we do to deseve this pain? "- Balarama. Balarama has been literally running to everyone he knew to save his twin babies. He has fallen sick and has no strength but he has not given up. He is desperate to take his babies home. He and his wife are holding on to their life only with a hope that their babies are strong fighters and they'll make it. Balarama is a daily wage worker. He earns Rs 250-300 per day. He has borrowed heavily from his friends and yet his bills are unpaid. His twin babies need an intensive treatment for next 6 weeks at least. 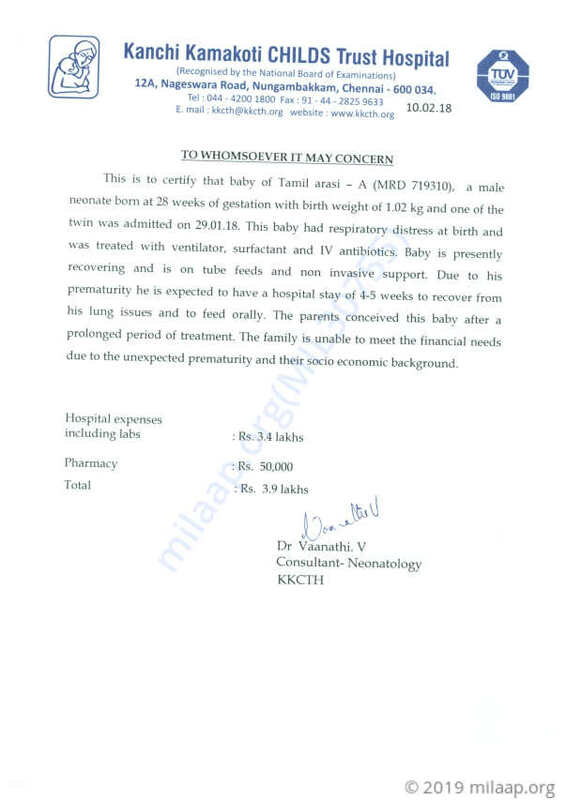 They need 4.25 lakhs + 4.25 lakhs to continue the treatment for the twin babies. 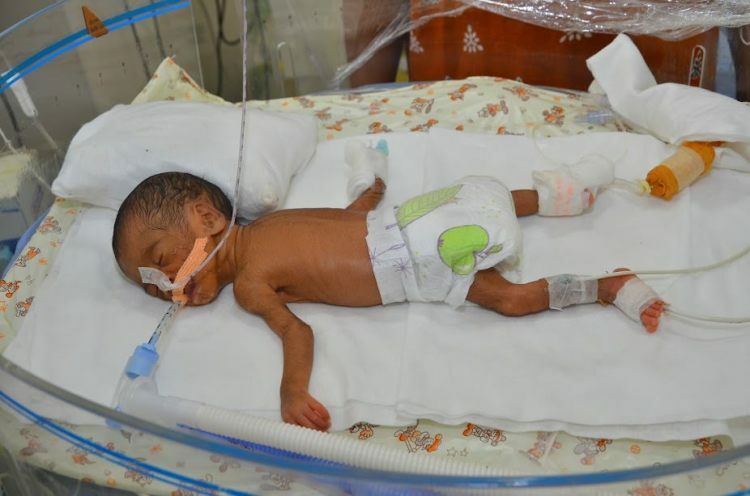 Your contribution can help the twin babies to survive! Thank you for the wonderful support that you have shown towards my twins. Both of them are doing really well and based on their health and recovery, they have been discharged about a week ago. The baby boy weighs about 2.5 kilograms and the baby girl weighs about 3.5 kilograms. They have been advised regular follow-ups until they achieve normal milestones. Thank you all once again. Please do pray their health and speedy recovery. Here is an update on the babies. The twin babies are still on minimal oxygen support and they are stable. They are both on tube feeds right now. The family is thankful for the support all of you have shown. There is still a long way to go for these little ones. Please share the campaign within your network to help them in this difficult time. Thank you once again for the love. Here is a quick update for you on babies' health. 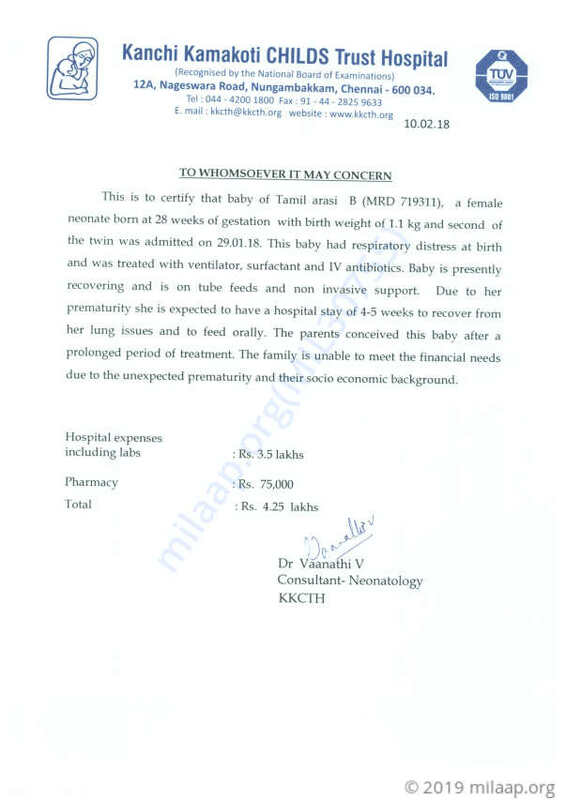 The twin babies have responded well to the treatment and doing better. They had respiratory distress at birth and were treated with ventilator, surfactant and currently babies are on minimal oxygen support. They will be kept under observation for another 2-3 weeks for wearing of oxygen and feed establishment.